Despite being one of the oldest stadiums in the NFL, Arrowhead Stadium has withstood the test of time, what with its unique shape and its propensity for noise. It became a model on which the modern football stadium is based, and to this day remains a football oasis where Chiefs fans can tailgate to their heart’s content pregame, before heading inside to yell themselves hoarse while watching the home team in action. The stadium does look a bit different than it did when it first opened in 1973 thanks to a series of renovations, but the spirit remains. There are plenty of reasons why Arrowhead ranks high on many sports fans’ must-see list. Arrowhead Stadium is one of two venues that make up Kansas City’s Truman Sports Complex, with the Royals’ Kauffman Stadium being the other. It’s a huge site right along Interstate 70, and it’s basically two stadiums (along with the Chiefs’ practice facility) surrounded by acres of parking. So it’s a fully functional and wonderful site for the die-hard local Chiefs fans who come in hours before kickoff to tailgate, but it’s a challenging place to get to for the uninitiated. One thing is fairly certain: If you have a car, you’re pretty much set. From downtown Kansas City, head east on Interstate 70, and just after the I-435 interchange, exit at the Blue Ridge Cut-Off. Head south from there and enter the Truman Sports Complex through one of three gates. (For more detailed driving directions and info on alternative entries, click here.) General parking begins at $30; you can also purchase advance parking here. The stadium’s location and relative isolation from major population centers mean few options exist in the way of public transportation to the game. If you don’t have a car, your best bet is to take a taxi or use a ride-sharing service. Perhaps because it’s the land of fine barbecue, Kansas City is home to one of the finest tailgating scenes in the NFL, and the giant parking lot lends itself to some epic parties. Long-time Chiefs fans have access to an “early arrival pass” that allows them to set up their tailgates up to 5 1/2 hours before kickoff. The team also sells “private tailgate suites” — basically premium space with special privileges. If you can’t round up a few friends to hold a tailgate party, the Chiefs do hold a tailgate party for an admission price. Info can be found here. You might as well soak up the tailgate scene, because there isn’t much else to do around the stadium, save for a few fast-food restaurants and hotels. Despite being built in the 1970s and showing telltale signs of having been a product of that particular era of stadium design (the circular ramps are a dead giveaway), Arrowhead is far from a cookie-cutter. 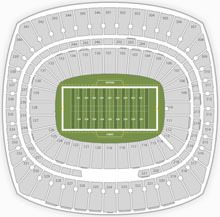 Its unique shape means there are far more seats along the sidelines than behind the end zones in the upper seating bowl, and two football-shaped HD videoboards stand behind the end-zone seats. And don’t forget that Chiefs fans can bring the noise, regularly competing with Seahawks fans at CenturyLink Field for the loudest-noise-at-an-outdoor-stadium record — K.C. currently holds the upper hand, at 142.2 decibels. At Arrowhead’s food stands you can find food representative of Kansas City’s cuisine, including barbecue from Fiorella’s Jack Stack BBQ — try the burnt ends, a specialty unique to K.C. Also worth checking out: The Foolish Dog (loaded hot dogs and tater tots), Sheridan’s Frozen Custard (if you’ve never heard of frozen custard, it’s a thicker form of ice cream popular in the Midwest), and Unforked (serving tacos, nachos and frozen margaritas).